Billionaire Elon Musk is working for free. Sort of. The Tesla (TSLA) chief executive's total compensation package in 2014 was $35,360, according to a regulatory filing. That would only get you half way to buying a Tesla Model S.
But the founder of the electric car maker didn't accept even that amount, and he didn't receive any cash from stock or bonuses last year. In fact, Musk has never accepted his Tesla salary, according to the Wednesday filing. Tesla said it calculated Musk's modest salary using what it called "annualized minimum wage requirements" under law in California, where the company is based. Still, Musk is hardly crying poor. Elon Musk has never accepted a salary as chief executive of electric car maker Tesla. Musk was awarded just over $78 million in options and cash in 2012. 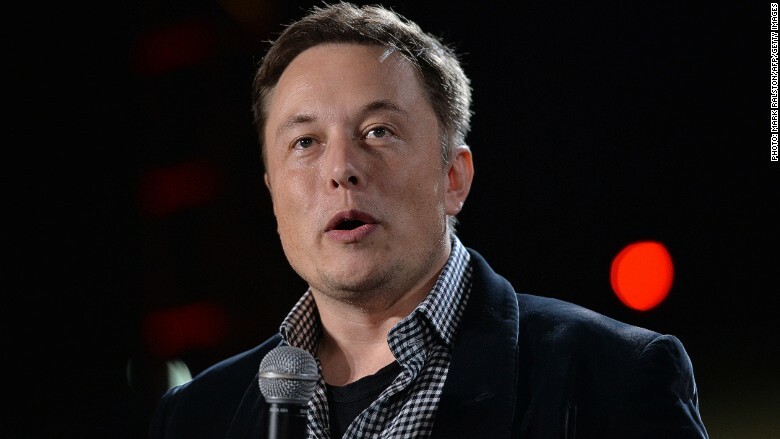 The billionaire entrepreneur, who also heads up rocket maker SpaceX, currently holds 35.3 million Tesla shares. That translates to a paper fortune of roughly $7.8 billion. Tesla is currently worth $27.6 billion, and Musk's wealth grew $2.6 billion last year as the stock soared nearly 50%. On top of his Tesla riches, Musk has other income sources in SpaceX, and green energy firm SolarCity (SCTY). He's the chairman of SolarCity and holds a 21% stake. Other Tesla executives were more handsomely rewarded last year. Chief financial officer Deepak Ahuja was paid $3.8 million in cash and options, while chief technology officer Jeffrey Straubel took home $17.1 million. The healthy pay packets follow a strong year for Tesla. The firm met its goal of making 35,000 vehicles in 2014 and $1.1 billion in sales - a 44% jump on the prior year. Its new Model X SUV is set to start shipping in six months, and early demand appears strong. Musk is confident about the future. The chief executive said earlier this year that Tesla could be worth $700 billion by 2025 -- roughly the size of Apple, the first U.S. company to be worth that whopping valuation. - CNN's Chris Isidore contributed to this report.